Recently came across a situation where i had developed a report and there was no rows being returned from the dataset. On investigating i found that for the parameters passed to the stored procedure, the stored procedure would not return any rows. 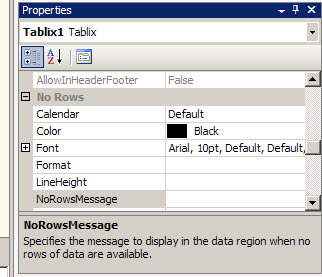 When the report was being displayed it was blank, the user wanted some kind of message to be shown on the screen to indicate that no data is available. I went about researching this issue and found that there are a couple of ways to handle this issue. 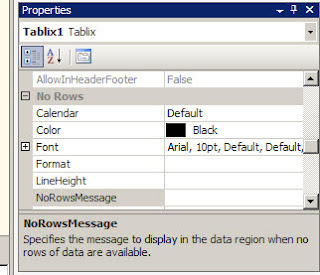 One is look in the properties of the tablix, there is a NoRows Section, in the section there is a attribute called NoRows Message, this attributes allows one to specify the message to display in the data region when there is no rows of data available. Here one can fill in the message to be displayed and this message will show up when the report is run and there is no data available. There is also a blog write up from Jen McCown who owns the site MidnightDBA.com/Jen who suggests a different method for handling the no rows for a dataset situation in the following link.